Citigroup managed to beat earnings expectations for the first quarter on Monday. However, the bank missed revenue estimates. Citigroup's consumer business performed well in the last quarter. Net interest income growth going forward is muted. Citigroup's shares are priced at a discount to book value, but are not a screaming buy. Citigroup, Inc. (NYSE:C) reported mixed results on Monday. The Wall Street bank managed to beat on earnings but missed revenue expectations. Even though Citigroup's shares are still priced at a discount to accounting book value, growing downside risks and the Fed's scaled back interest path are weighing on the investment thesis. 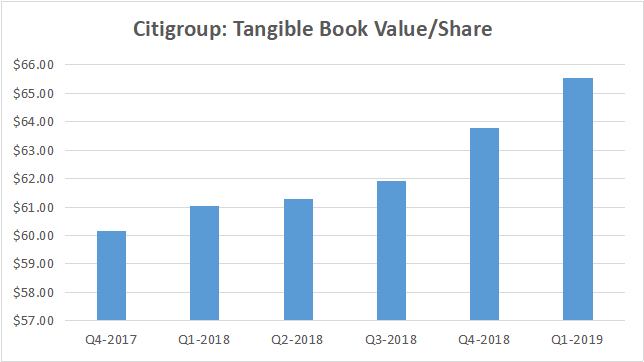 Citigroup is buying back a ton of shares, but that may not be enough to entice investors to buy. In the first quarter of 2019, Citigroup's revenues decreased two percent to $18.58 billion compared to the first quarter of 2018 when the bank pulled in $18.87 billion. The reported revenue figure slightly missed consensus revenue expectations of $18.63 billion. 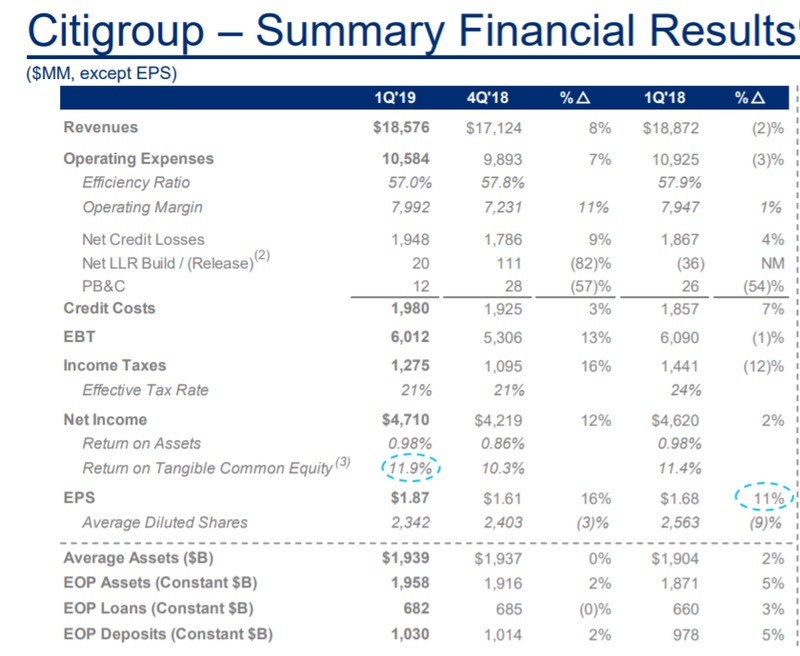 Citigroup's earnings, however, were not that bad: Q1-2019 earnings were reported at $4.71 billion, up 2 percent compared to the year-ago period. On a per-share basis, Citigroup raked in $1.87/share in profits, marking an eleven percent year-over-year increase. The analyst consensus estimate was for earnings per share of $1.80. 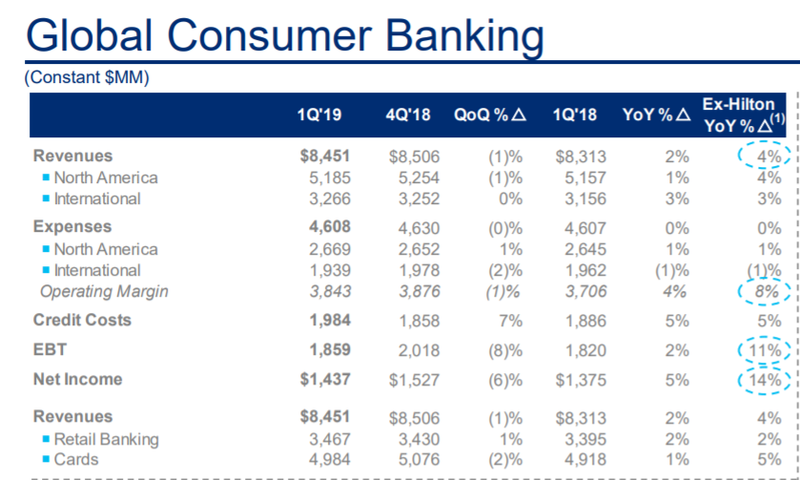 Citigroup's consumer business remains in good shape. 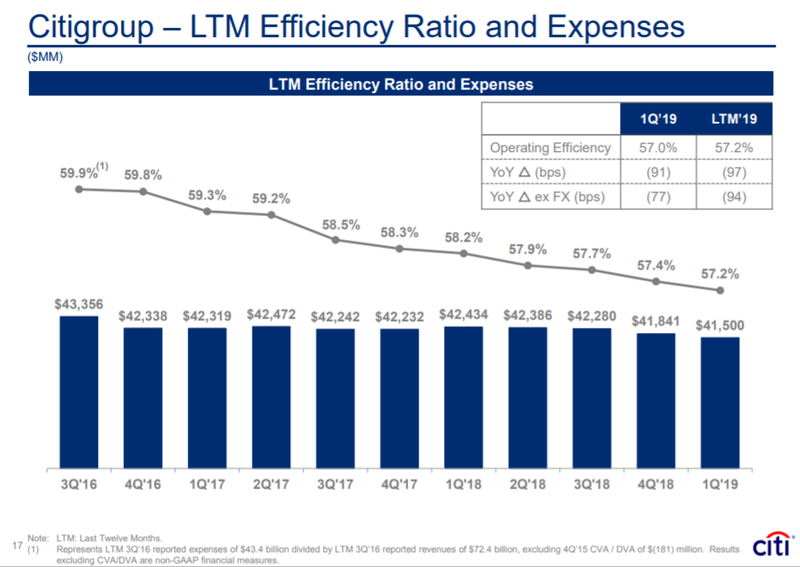 The bank's largest business enjoyed 4 percent year-over-year revenue growth to $8.45 billion in the last quarter and benefited from an operating margin improvement. Total division earnings jumped 14 percent year over year to $1.44 billion. Citigroup's net interest income has continually increased throughout 2018 as the Fed raised short-term interest rates: In an environment of rising rates, banks can charge more money for loans which has a positive earnings impact. 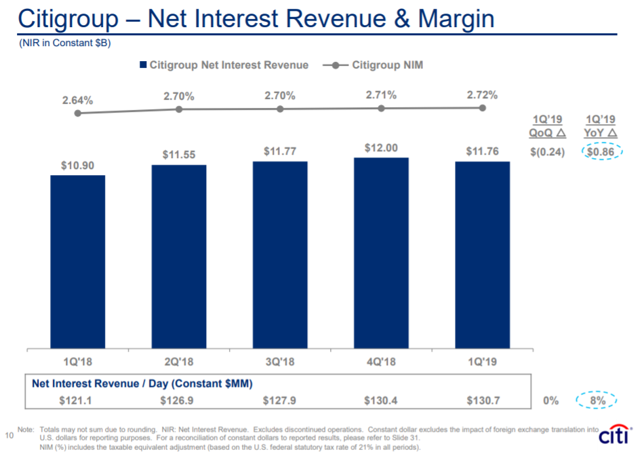 Citigroup's net interest income has risen from $10.9 billion in Q1-2018 to $11.8 billion in Q1-2019, reflecting an increase of 7.9 percent. That said, though, the Fed has muted its interest rate outlook in March due growing downside risks and slowing economic growth. Citigroup's shares are still priced at a discount to accounting book value and are the cheapest in the sector. 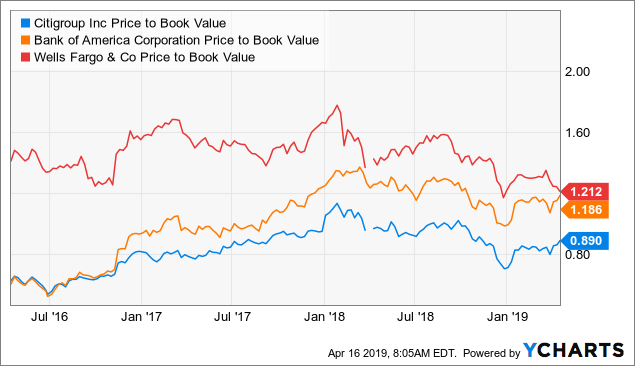 Here's how Citigroup's P/B-ratio compares against the price-to-book-value-multiples of Bank of America (BAC) and Wells Fargo (WFC). 2. The Fed's scaled back interest rate path limits Citigroup's net interest income growth. With the Fed muting its economic (and interest rate) growth outlook for the remainder of 2019, Citigroup will have a harder time going forward to produce net interest income growth. Downside risks could grow even further in 2019 if a U.S.-China trade deal doesn't materialize and corporate earnings growth slows throughout the year. Though shares are still priced at a discount to accounting book value, the overall value proposition is not that convincing.